SUMMARY: Sequel to The House of the Scorpion. Continues the story of Matteo, a drug lord's clone who becomes the Lord of Opium when he inherits El Patron's legacy. REVIEW: Some books just don't need a sequel. While The House of the Scorpion did leave some loose ends, so much time went by between my reading of the first and second books, I was perfectly happy with it as it stood. I absolutely ADORED The House of the Scorpion, and for me, The Lord of Opium just didn't measure up. For book two, you have the same major characters--Matteo, Maria, Celia, Matt's friends The Lost Boys--with many new characters added in. It's been about three years since I read The House of the Scorpion, and I probably should have reread it before starting The Lord of Opium. I didn't remember much beyond the basic gist of the story and Matt's potential romance with Maria. The book focuses mainly on Matt's growing into his role as the Lord of Opium and his attempts to restore the eejits to their former, more human, state. I was really hoping for more Matt and Maria, but while it is certainly there, the two are separated for much of the book. Maria doesn't even make an appearance until about 100 pages in, and even after that, Maria shows up only sporadically for maybe another 200 pages. I know this isn't a romance novel, but I can't help but wish there had been more interaction between these two major characters. The subplot about Mirasol, an eejit, and Matt's attempts to cure her is an interesting part of the story. Matt's attraction to her is a little disturbing though; if he loves Maria so much, why is he sidetracked by a girl who isn't able to do much more than follow him around and mindlessly follow orders? I did like the book's complexity. Matt is believably flawed, and I always love that in my protagonists. In the span of a few pages, Matt may get mad, question himself, feel entitled, be conflicted, want to leave, want to stay, and feel compassion for the eejits. Even his appearance is imperfect (he has bad acne from working at the Plankton Factory in the previous book), further separating him from the typical "Gary Stu" status. As with The House of the Scorpion, Farmer's world-building is top-notch. 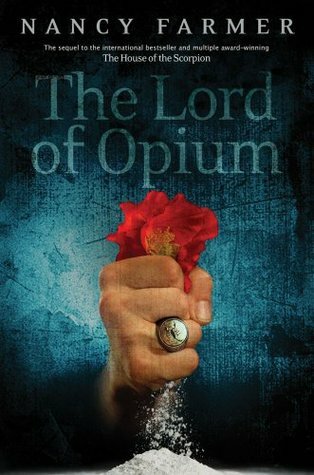 THE BOTTOM LINE: Despite my disappointment, I am glad to have read The Lord of Opium and discover how things turn out for Matt and Maria. It's nowhere near as strong as its predecessor though.